If you follow these 11 scientifically proven tips, you can quickly increase your Bench Press strength and prevent injury. 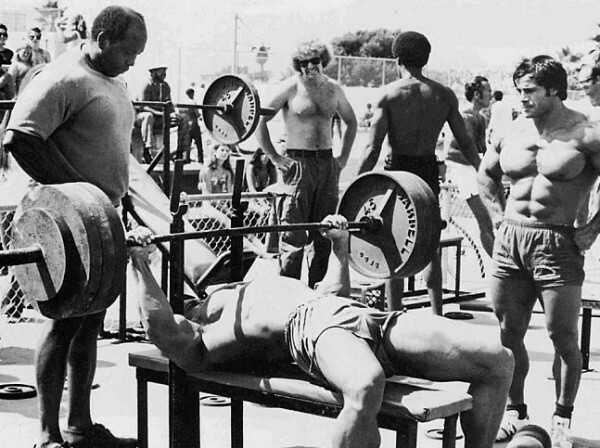 Like it or not, the Bench Press is one of the primary lifts on which your strength is judged. Nothing turns heads faster in the gym than an impressive Bench Press, and it’s the first (and often only) lift people want to know your numbers on. There’s a good reason for this beyond ego, though. The Bench Press is one of the best upper body exercises you can do because, when performed properly, it trains not just the pectorals but the lats, shoulders, triceps, and even the legs (through a proper leg drive, as discussed later in this article). Every chest workout or push workout should include at least a few sets of the Bench Press. That said, like the other big compound lifts (Deadlift, Squat, and Military Press), the Bench Press is actually quite technical. If you don’t know what you’re doing, you’ll quickly hit a plateau, which is not only frustrating, but can set you up for injury as you try to break through it by compromising form. So, in this article, we’re going to look at 11 safe, scientifically proven ways to increase your bench press and, in some cases, also reduce the risk of injury. Would you rather listen to this article? Click the play button below! Want to listen to more stuff like this? Check out my podcast! Tip #6 to Increase Your Bench Press: Work On Your "Upper Chest"
What do you think about these tips on how to increase your bench press? Have anything else to share? Let me know in the comments below! If you an experienced weightlifter, you know the importance of being mentally prepared for heavy lifts. You can psych yourself out or up and hit or miss a lift accordingly. You’ve undoubtedly seen powerlifters go through what sometimes looks like a ridiculous, satanic ritual before attempting a lift, but did you know that pumping yourself up like that has been scientifically proven to work? A study conducted by researchers at AUT University with elite rugby players found that when they pumped themselves up for a Bench Press set, force production increased by 8%. Researchers also found that distraction significantly decreased force production–there was a 12% difference in force production between the pumped-up and distracted lifters. The takeaway here is pump yourself up your for heavy lifts and concentrate on each rep as your perform it–no talking, being talked to, or mental wandering. I don’t stomp around the gym like a madman to get pumped up. I find that the right workout songs helps dramatically for getting pumped up. Also, before I grab the bar, I like to take 10 to 15 seconds to focus on the lift I’m about to perform and visualize myself performing it successfully. I know that sounds kind of silly but research shows that visualizing a successful lift before performing it can increase strength. If you’re new to weightlifting (you’ve been lifting for less than a year), this tip doesn’t apply to you. You should stick to the advice give in my article on the ultimate chest workout. If you’re an experienced weightlifter, however, you can benefit from working in different rep ranges, or periodizing your training, as it’s known. The 2 to 3 rep work provides maximal overload, which is crucial to building muscle and strength; the 4 to 6 rep work is the “sweet spot” for myofibrillar muscle growth; and the focus of the 8 to 10 rep sets is cellular fatigue, which also stimulates muscle growth. While many people believe that slowing the weight down improves performance, research says otherwise. This study demonstrated that, when bench pressing, lowering the bar quickly (1 second) and, without pause, then exploding it upward results in greater power gains than a slow descent followed by a pause and explosive ascent. That said, don’t bounce the bar off your chest at the bottom of the rep. This isn’t only cheating, it can hurt quite a bit as the weights get heavier. Don’t simply “drop” the weight toward your body, either–you want to feel as if you are pulling the bar toward your chest, which is something we’ll be talking more about soon. You might be surprised how many guys write me concerned about their Bench Press being stuck, but who are performing as the last exercise in their workouts. They usually start with dumbbell work, then maybe move on to Dips, and finally come around to the Bench Press for their final few sets. Well, studies such as this and this have shown that the order in which you do your exercises has a significant impact on your strength and overall performance capacity on each. This is why my Bigger Leaner Stronger and Thinner Leaner Stronger workouts always begin with big, compound lifts like the Bench Press, Deadlift, Military Press, and Squat, and then move on to more isolation-type exercises like Dips, Dumbbell Rows, Side Lateral Raises, and Lunges. 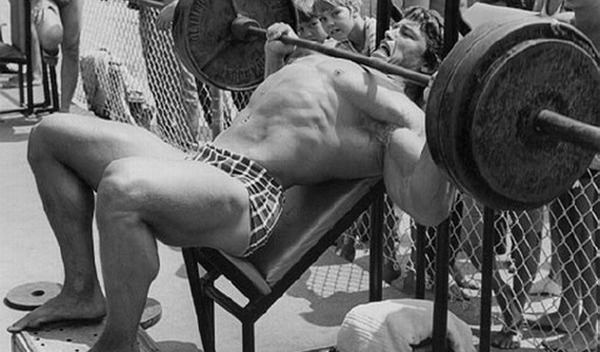 Start your chest workouts with the Bench Press and you’ll be most likely to make progress. Like “ideal” rep ranges, optimal training frequency is a hotly debated subject. The bottom line is it boils down to workout intensity and volume. The lighter the weights and fewer the sets per workout, the more often you can train the muscle group. And, as a corollary, the heavier the weights and greater the sets per workout, the less often you can train the muscle group. When training with the proper intensity (focusing on lifting heavy weights), optimal frequency seems to be about 40 – 60 reps performed every 5 – 7 days. While training each muscle group 2 to 3 times per week is trendy right now, and while it’s workable (if volume is programmed correctly), it’s not necessarily more effective than training each muscle group once per 5 to 7 days, at the right volume. The bottom line is when it comes to muscle and strength gains, research shows that proper workout volume appears to be more important than frequency. If you do less than the optimal volume, as given above, you will be leaving some gains on the table. If you do more, you’ll probably end up overtraining. Want a workout program and flexible diet plan that will help you build muscle and lose fat? Download my free no-BS “crash course” now and learn exactly how to build the body of your dreams. 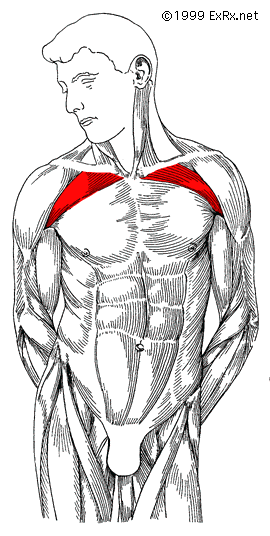 An underdeveloped upper chest not only looks bad, it compromises your overall Bench Press performance. 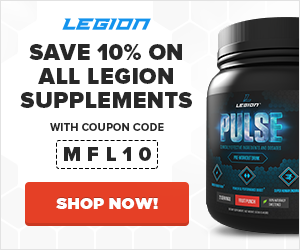 Avoid this by always including incline pressing in your chest workouts, which has been proven to be particularly effective for building all of the muscles involved in the flat Bench Press. Powerlifters have been using different grip widths for many years and studies back this up as an effective method for increasing bench press strength. Research has shown that a wide grip (several inches wider than shoulder-width) emphasizes the larger, prime mover muscles (the pectorals), whereas a narrow grip (right at shoulder-width, or slightly narrower) emphasizes the smaller muscles involved, such as the arms and shoulders. By varying your grip widths, you’re able to focus on each of these muscle groups and strengthen each, which can help you break through sticking points. A good way to do this is to include 1 to 2 wide-grip sets in your chest workouts, and close-grip sets in your arms workouts. The Bench Press gets a bad rap for ruining shoulders, but that’s not the whole story. It’s bad for the shoulders when performed incorrectly, and the biggest mistake people make is flaring their elbows out as they ascend. 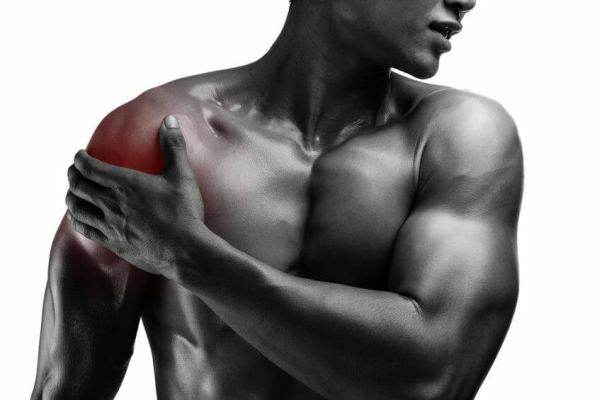 Research has shown that keeping your arms at about a 45-degree angle relative to your torso, and using a medium grip, is the best way to protect your shoulders. It’s been proven time and time again: if you want to get strong on the Bench Press (and Squat), stay off the Smith machine. The reason why is simple: the Smith machine simply activates less muscle fibers than the free weight Bench Press. If your gym doesn’t have a free weight Bench Press station, change gyms. If you can’t, then you can begrudgingly use the Smith machine (it’s better than no bench pressing at all). This is another old-school powerlifting tip that has been scientifically validated. The idea is simple: as you descend, pull the shoulder blades together and try to actually bend the bar in half or “pull it apart,” and maintain this position and tension as you ascend. You should feel like you’re pulling the bar down toward your chest, and doing this not only increases shoulder stability, it also accounts for a fair portion of the upward force. This, by the way, helps explain why you can’t dumbbell press as much weight as you can bench press. More stabilization is required with dumbbells, but more importantly, you can’t generate this lateral force as it would cause the dumbbells to move away from each other. “Screw” your shoulder blades into the bench by setting up onto your upper back, with a lower back arch big enough to fit a fist in between it and the bench. Don’t lose this position when you lift the bar off the rack and maintain it throughout each rep. Create a stable lower body base by placing your feet directly beneath your knees and forcing your knees out, which will tighten your quads and activate your glutes. This allows you to push through your heels as you ascend, creating the “leg drive” that you’ve probably heard of. Grip the bar as hard as you possibly can. Can Spices, Herbs, and Essential Oils Improve Your Health?